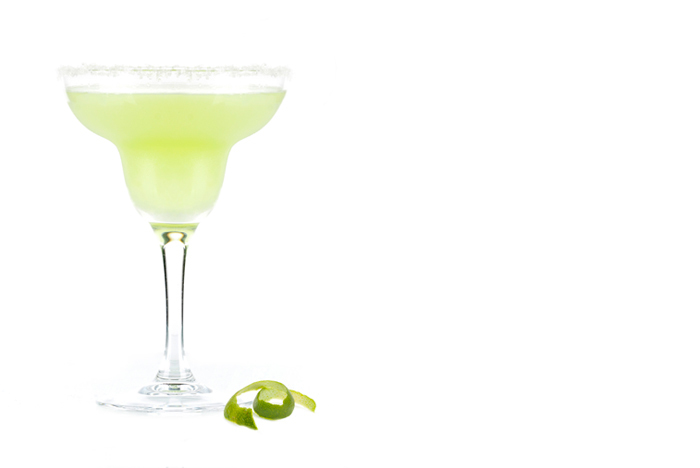 A popular myth states that the Margarita cocktail originated in Mexico. The personality and taste of the cocktail reflects the flavor of its native land. A versatile cocktail which lends itself to several methods of preparation and variations in fruit flavorings makes it one of the most common tequila-based cocktail in the world. It blends easily with liqueurs. The drink is served shaken with ice, on the rocks, blended with ice / frozen margarita or without ice (straight up). Margaritas may be served in a variety of glasses, most notably the stereotypical margarita glass, a variant of the classic Champagne coupe. Rub the rim of the glass with the lemon or lime slice to make the salt stick to it. Add tequila, lemon/lime juice, Cointreau/triple sec and sugar to a shaker and shake for few seconds. Carefully pour into the glass (taking care not to dislodge any salt). Garnish and serve over ice. Garnish: Lemon or lime twist, salt. I love margarita’s. Especially with sugar instead of salt on the rim. This one looks fabulous! This is really interesting, You’re an overly professional blogger. I have joined your rss feed and stay up for looking for more of your wonderful post. Additionally, I’ve shared your web site in my social networks!